To create a new Best-Hold Selection Sort Order, go to Admin → Server Administration → Best-Hold Selection Sort Order. Assign your Best-Hold Selection Sort Order a Name. 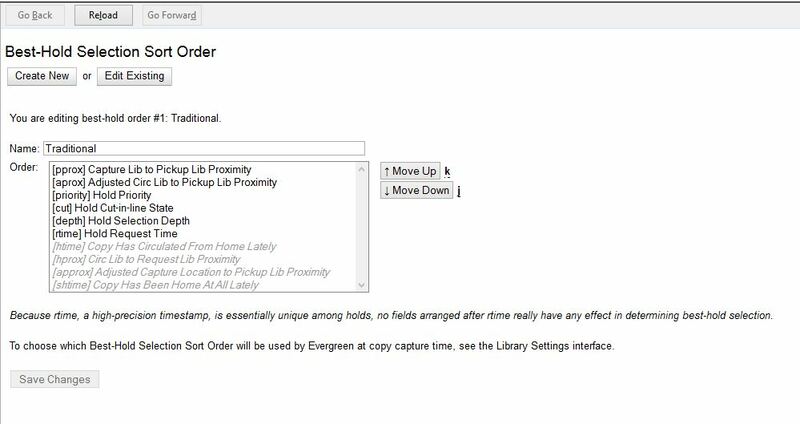 Next, use the Move Up and Move Down buttons to arrange the fields in the order that you would like Evergreen to check when looking for the best hold to fill with a copy at opportunistic capture. Click Save Changes to create your custom Best-Hold Selection Sort Order.